So What is Findability Anyway? Simply put, findability looks at how people get to your content and how easy it is to find. No matter if you create marketing collateral, support content, technical documentation, or any other kind of content, you want to make it as easy as possible for your customers to find. That means it's got to rank well for search. SEO companies have many techniques to help you rank higher search engines and beat your competitors, but the goal of findability is a little different. Findability focuses on how people search for information and how to help people find that information. 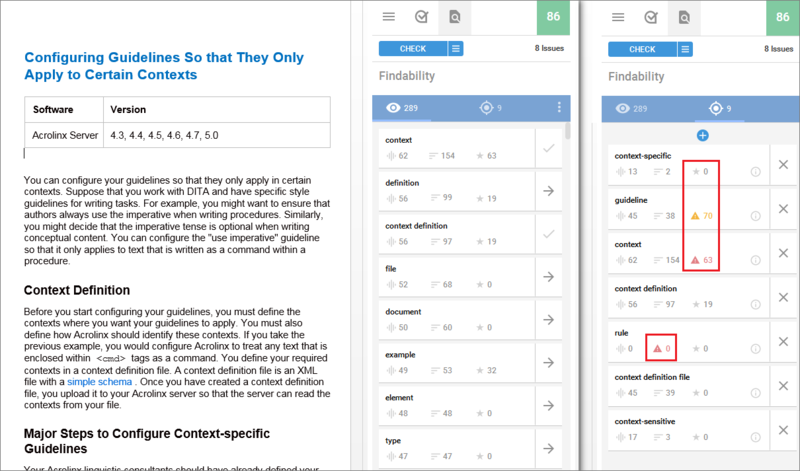 Findability includes disciplines such as information architecture, navigation design, and content optimization. Acrolinx helps you optimize your content so that it's high-quality, on-brand, and on-target. On top of that, Acrolinx Findability helps you ensure that your content is easy to find when people enter relevant keywords in a search engine. We call these relevant keywords target keywords, because you want to make sure your content shows up for those keywords. You can also use Acrolinx to discover what keywords frequently show up in your content — we call these discovered keywords. For each piece of content, Acrolinx shows you discovered and target keywords and tells you what keywords are on-target. You can also review your target keywords and see which ones are missing from your content. Before you check your content for findability you need to identify your target keywords. There are different ways you can identify target keywords for your content. If you work for a company with an enterprise SEO solution, you might already have a keyword information system and database of target keywords that you're supposed to use for certain projects. Acrolinx can integrate with your keyword information system to get the target keywords for your project. In this case, your Acrolinx administrator configures Acrolinx to prompt each writer for a project key. When you run a check, you select the project that you're working on, and Acrolinx shows you the proposed target keywords for your project. If you use Acrolinx with a keyword information system, you'll see a few extra elements in the sidebar. The Keyword Information System tab. This tab shows the keyword information that is available for your project. This is usually a full list of project keywords but the information can vary depending on the SEO solution that you use. This section shows you the keywords that your keyword information system has proposed for your project. You can use these buttons get additional information about individual keywords from your keyword information system. Click additional information to open additional information from an external keyword information system in a new window. Click additional information summary to display a short summary of additional information from an external keyword information system. Another approach is to see what keywords are already used frequently in your content or in similar content that's already ranking highly. You can check that content to see what keywords Acrolinx discovers and pick out any keywords that you might have missed from your list of target keywords. We go more into discovered keywords in the section " Checking Your Content for Findability . " If you don't have any enterprise SEO solution, you'll need to do a bit of research. To build a good list of targeted keywords, you need to anticipate how people are going to search for content like yours. For example, if you're writing a thought leadership article about SEO practices, you want to think about how people are going to find that content. What are your potential readers trying to find out? You've probably identified a target audience before you created your article, so you can use your target audience to get your target keywords. For example, if your target audience is marketing managers, they might be researching ways to increase traffic and conversions without spending too much budget. You could target related keywords such as "increase", "conversions" and "organic traffic" and obviously "SEO". You could also include words that describe a similar goal to "increase", such as "grow" and "optimize". When aiming for findability, try to get a good range of keywords. Sometimes people use terminology that you don’t necessarily want to use heavily in your article. It might be dated terminology or simply terminology that you prefer not to use. But that doesn’t mean people who search for these keywords won’t find your article useful. You still want your article to show up for these searches. For example, we recently renamed some terminology on our own product. What we used to call linguistic resources , we now call a guidance package. However, we know that people need a while to catch up on the new terminology. We still anticipate that people will use the keyword linguistic resources when searching for help. That's why we still include this keyword in the content. Make no mistake, we don't want to use obsolete terminology, but it's helpful to mention that "product X" used to be called "product Y" or is also known as "product Z." This is a useful way to include a target keyword without detracting from the consistency in your terminology. There are many tools help you figure out how people are searching for the type of content that you’re offering — and what keywords to build into your content. Here are a few examples. After you've identified your target keywords, you can enter them in the Acrolinx sidebar. Here's how you do it. Open a document, then open the Acrolinx sidebar if it isn't open already. Click CHECK to check your content and discover existing keywords first. 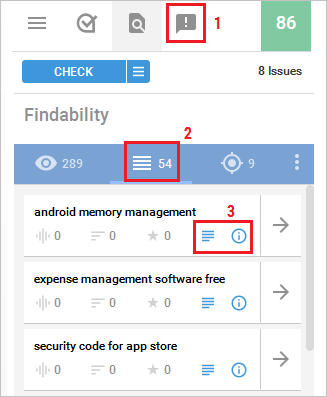 In the Acrolinx sidebar, open the Findability tab. Add new and discovered keywords to your list of targeted keywords. Open the Target Keywords section. Click the Add button, and enter your target keyword. Open the Discovered Keywords section. Find a keyword and click the "Add" button next to the keyword. Open the Proposed Keywords section. Acrolinx permanently stores this keyword for your document. You'll always see this keyword in the Target Keywords section whenever you open and check your document. If you have a long list of target keywords, you'll want to put your most important target keywords at the top. That way, you can keep a closer eye on the findability metrics for these keywords. Additionally, the priority of your keywords influences how Acrolinx validates the prominence of your keywords. If high-priority keywords have low prominence scores, you'll see prominence warnings in the sidebar. You can order your list by dragging and dropping the keyword entries in the Target Keywords section. Acrolinx can check your content and tell you what keywords a search engine would probably prioritize when indexing your content — these show up as discovered keywords. You can then see how many of your discovered keywords match up with your target keywords. Click CHECK to check your content, discover existing keywords and get findability metrics for targeted keywords. Open the Findability tab and review the keywords. These are keywords that frequently show up in your content. There are a few metrics we use to build this list, which we'll go into further on in this section. These are keywords that you want to target for findability. They should include the search keywords that you want your content to match against. Review and analyze the keyword information to see how you can optimize your content. When you review your discovered and targeted keywords, you can use the findability metrics to help organize and assess your keywords. Frequency The frequency metric is a measurement of the keyword count in relation to the size of the document. It's expressed as a score out of 100. Count The number of times the keyword appeared in your content. Prominence This metric measures the prominent placement of keywords in your content. Prominent placement can be in the document title, headings, or opening paragraph. Acrolinx uses a special formula to give each keyword a prominence score out of 100. The keyword that's above this one has a lower prominence score. 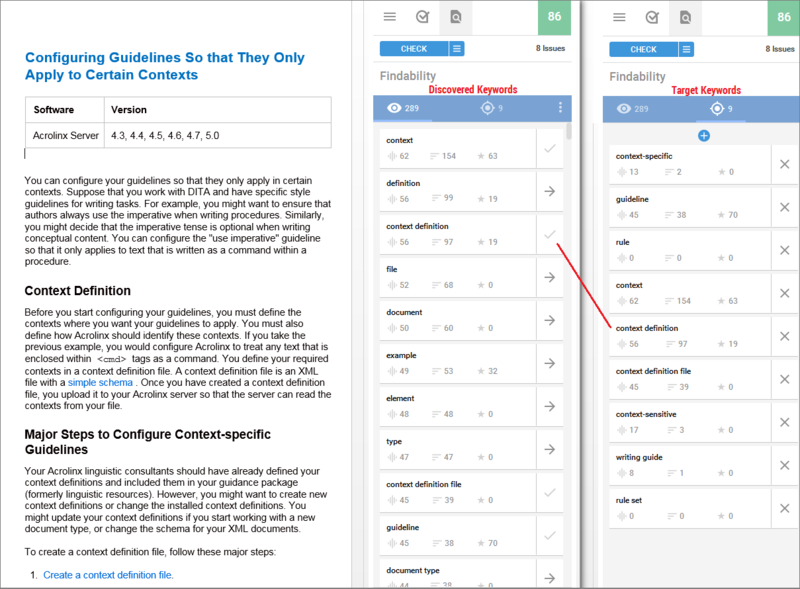 In this example, we need to make the keyword "context definition file" more prominent in the content, or drag it below the keyword "guideline" so that "guideline" has a higher priority. 2) Red prominence warning The keyword that's two places higher in priority has a lower prominence score than this one. In this example, we need to make the keyword "context definition file" more prominent in the content, or drag it below the keyword "context" so that "context" has a higher priority. 3) Red count warning The count is zero, so it looks like this target keyword is completely missing from the content. In this example, we need to add the keyword "rule" at least once in the content. Earlier on in this article, we discussed how synonyms can increase the findability of your content. We mentioned an example of some terminology that we changed in our product content. Let's take a look at that example in more detail. Remember that we stopped the terms "rule" as in "style rule." Instead, we say "guideline." But of course we expect most of our customers to enter "rule" as a search term when looking for help on anything related to style or grammar guidelines (formerly "rules"). If we don't include those terms in our content somehow, people will have trouble finding it. The following illustration shows the discovered and targeted keywords for help article about content-specific guidelines. We've highlighted some important keyword metrics in the targeted keywords list. The prominence of our top keyword is 0. This is our top keyword but it's not prominent enough in the article. This might be a problem if people are quickly scanning the article to see if it's relevant for their task. We want our top target keyword to be prominent so that people can quickly see exactly what the article is about. You can see the prominence warnings for the two keywords underneath it. As we explained in the section on warnings, these prominence warnings indicate that a keyword further up in the list has a low prominence score. 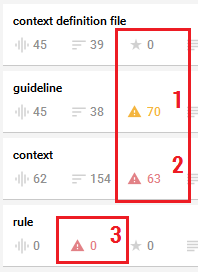 The frequency for the keyword "rule" is 0. To solve the second problem, we can change the title and introductory sentence so that they both include our top target keyword. If we run another check, you can see that the metrics that we initially highlighted have improved. 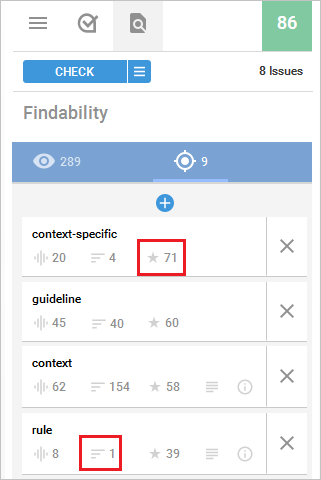 The frequency and prominence scores for the target keywords "rule" and "context-specific" have gone up, so we've improved the findability for those target keywords. Try using a similar method for your own content. Create a comprehensive list of target keywords for your piece of content. Make sure that the frequency is greater than zero for all target keywords. Make sure that the prominence scores of your top target keywords match the order in which you've prioritized them.